Independence, Oregon – At the break of dawn last week, tractors rolled into the Rogue Farms hopyard to begin their 8th harvest. Over the next four weeks, our 8 varieties of our proprietary hops will be picked, stripped, sorted, kilned, cooled and baled before being driven 77 miles to the Rogue brewery in Newport, Oregon. This year, the global production of hops is set to rise 21%, the highest in seven years. Hop acreage in the Northwest alone is up 17%, a record high. At Rogue Farms we planted an additional 10 acres this year, bringing our total hop acreage to 52. This accounts for .039059422% of global hop acreage. “The hop market has changed a lot since we became farmers in 2008,” said Brett Joyce, President of Rogue Ales. 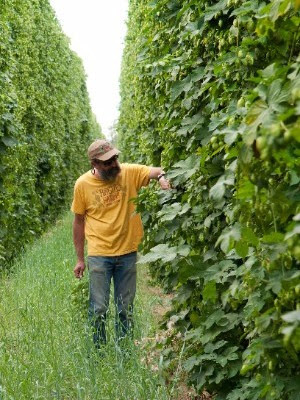 “The ingredients we grow at Rogue Farms are by far the most expensive ingredients we use, but we’re able to guarantee our supply and quality as the demand for hops, especially the aroma varieties like we grow at Rogue Farms, explodes across the country." 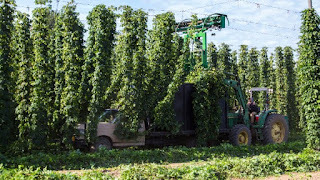 To see for yourself how Rogue Farms hops are harvested, check out our Farms blog's latest post.